So a few weeks ago, we saw an alien species arrived on Earth in giant flying saucers that hover menacingly over the major cities of the world...again. Of course, this happened in the original V mini-series. Then there was when Independence Day ripped off V. And now the premiere of the V series remake. It made me think about how aliens would introduce themselves. Would aliens really think, "Hey, here's what we'll do to announce our presence. We'll come screaming out of the atmosphere with no warning in our enormous ships, and hover menacingly for hours over all the major cities of the world." I think the 1950's plan of landing a single, small saucer on the front lawn of the White House makes more sense. 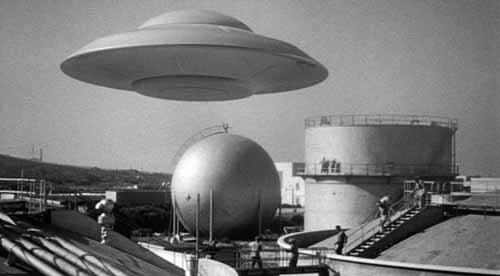 Then again, these days the UFO would probably get shot down before it landed by pilots thinking it was a terrorist plot. Yeah, it's not a very well formed plan. Imagine if America's plan was to sail a destroyer to the shore of every major city and then, at the same time, launch a missle. I'm pretty sure they'd get blown out of the water long before getting a pop off. PS: I like how V got in a little in-joke by referring to "Independance Day".